After a work trip away this week, I had a long journey back home which included a matrix of logistics that had my brain needing to think step by step, and, I will admit, my soul was heavy and complicated with new emotions and feelings that deserved attention. As I drive, I relax and go with the rise and fall of my feelings. I feel the strength and the tears, the empowerment and the loss and I attempt to pay no attention to any of them, I need to just let them flow in and flow out. Welcome them, see them, then let them go. Like water is in constant movement - I need to do the same. Trusting that what is true and healthy for me, will eventually settle. The miles and hours pass, the various drop off and collection points happen. Stairs, boxes, petrol, airport, return rental car, call a Lyft driver, blah blah blah. 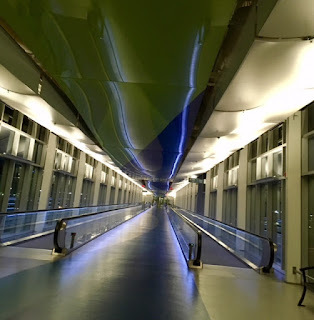 I even notice the emptiness of the moving walkway at the airport and what it conjures for me inside. How my brain lingers on the loneliness and not the moving forward.